I worry about people born in the 21st century. There’s something deep and dark stirring in our collective consciousness. They’re seeing it firsthand. The last generation grew up with at least the pretense of decency, with a sense that “the arc of history bends toward justice.” This decade says morality goes wherever the masses do; if they tug too hard in the wrong direction, the rest of the union gets yanked along by their preoccupations. People coming of age right now are seeing hate, selfishness, and shameless, lawless grift growing new roots. They’re being bombarded with bad news at a speed that’s dizzying to process, and they live with the expectation that they’ll be transparent about their thoughts and feelings all the while. It doesn’t make sense. It requires superhuman poise and a bold belief that in spite of what ails us right now, we, as a planet, are going to be fine in the end. That they’re adapting and not despairing is astounding. “Gen Z” will save the future, but only if we can get them there in one piece. 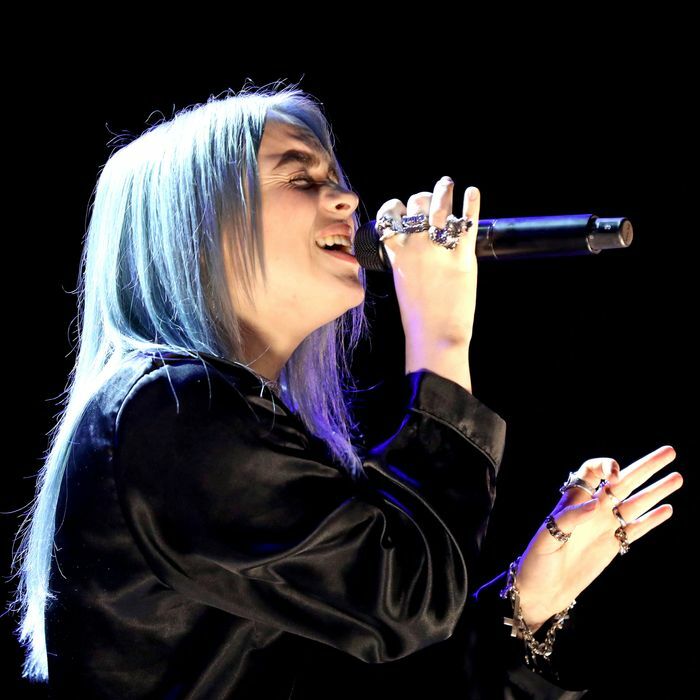 Billie Eilish is a 17-year-old singer-songwriter with a preternatural self-awareness, a sweet and mousy but also capricious singing voice, and an impeccable ear for melody. Eilish has only been writing music for five years; she composed her first song at 12 and recorded her first one at 13. She’s sharper than a lot of writers who’ve been at it for much longer. She is, like anyone living under the age of 21 through history, the picture of cool, aloof boredom. Eilish is not your archetypal millennial teen — she was homeschooled by her parents, the Scottish and Irish actors Maggie Baird and Patrick O’Connell, and encouraged in her interests in the arts by her older brother, Finneas, who also acts, sings, writes, and produces — but her music resonates because she is able to articulate the absurdities of the young American experience with wit, tenderness, and brutal honesty. Her debut album When We All Fall Asleep, Where Do We Go? is a quiet revolution, both intricate and also delicate, sweet but sometimes prickly, like berries in a bramble. Asleep is not without pop music precedent. Eilish and Finneas’s productions use dance-pop and hip-hop as launchpads into their own weird flights. The DNA of the abrasive EDM-rap of Kanye West’s Yeezus is present in “You Should See Me in a Crown.” “Bad Guy” and “Bury a Friend” both serve insular takes on the inviting, beguiling electropop of middle-aughts landmarks like Britney Spears’s Blackout. But there’s something puckish about the approach. “My Strange Addiction” apes the blocky synths of a Mustard hit, but the mix is haunted by the sound of fingers running up and down guitar strings, and the song breaks repeatedly to sample dialogue from The Office. “8” is a ukulele song that manipulates the singer’s voice to make her sound half her age. “Xanny” mimics a pill high; the tempo is slowed to a sluggish crawl, each drum beat landing just enough behind time to feel unexpected, as the noise of the room eddies like open water. The siblings make killer piano ballads, folk songs, and brash pure pop tunes. Vocals are stacked and tucked in strange formations. “Goodbye” matches pretty harmonies to dark messaging like the Beatles classic “Because”; “Bury a Friend” flanks the singer’s lead vocals with sinister, treated male vocals, Bon Iver style. Asleep is the odd post-Reputation pop album that seems versatile and post-genre by sheer function of taste and creativity rather than record company edict. In spite of a few moments where its bewitching gloom approaches caricature, Asleep is frequently stunning and doubly so for a debut album by someone not even old enough to vote. Eilish thinks it’s foolish that young people don’t have more of a say in the world, all things considered. “The world is ending,” she told NME earlier this year, “and I honestly don’t understand the law that says you have to be older to vote, because they’re going to die soon, and we’ll have to deal with it.” What would people under 18 do about our political, ecological problems, as citizens looking at another 50-70 years on the planet (unlike the folks who govern it, who are perceived as authorities by function of tenure, and who are burning through resources like they don’t care what happens next)? It can’t possibly be any worse than what we have going now.